If you have any questions or concerns, please e-mail us at [email protected]. 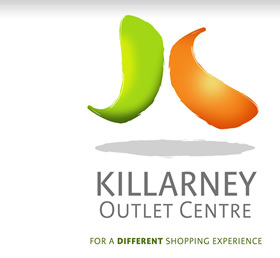 The “Personal Information” collected by the Killarney Outlet Centre website includes your name, postal address, telephone number, email address, company name, your position within the company, for example through the “Contact Us” page or other sections of the Site where the User can send emails, provide feedback or request information. We shall only use your Personal Information for (i) the purposes for which it was provided by you, (ii) verification purposes and statistical analysis, (iii) marketing, communication and administration purposes. Killarney Outlet Centre shall not disclose your Personal Information to a third party without your consent unless required to so in the interests of the administration of justice. Please note that we will disclose your Personal Information if required to do so by law, search warrant, subpoena or court order or in the interests of protection of intellectual property rights or the rights of other users or at any such other time as Killarney Outlet Centre acting in good faith may deem appropriate. Killarney Outlet Centre does not sell, lease or release by other means any non-member details to third parties. Any personal information provided by members for the website shall be maintained and processed by Killarney Outlet Centre in accordance with its obligations under the Irish Data Protection Legislation. As this information is compiled for the Killarney Outlet Centre website details contained may be passed to third parties operating in the retail industry. 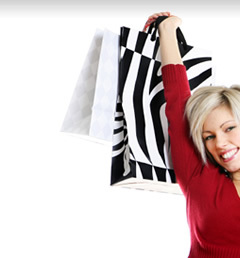 Killarney Outlet Centre may from time to time conduct surveys or competitions on the website. Supplying information in these circumstances is totally voluntary and you may decide not to disclose this information if you wish. If you have any questions about this policy or the Site in general, please contact Killarney Outlet Centre by post to Killarney Outlet Centre, Fair Hill, Killarney, Co. Kerry, Ireland or by telephone on + 353 (0)64 36744, or by email at [email protected]. By accessing killarneyoutletcentre.com, known in these Terms as the "Website" you are agreeing to be legally bound by these terms as modified from time to time ("Terms"). Your use of the Website constitutes your agreement to the Terms. 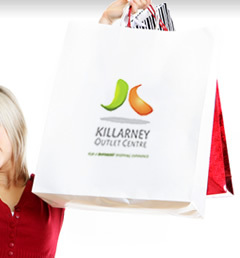 The Website is owned and operated by Killarney Outlet Centre, (in these Terms "KOC" means Killarney Outlet Centre). KOC reserves the right to suspend or terminate your access to the Website at any time, with or without notice or explanation. All intellectual property rights, including copyright, in the content displayed on the Website ("Content") belong to KOC or its licensors. All rights are hereby reserved. Except as set out above, you agree not to download, copy, reproduce, modify, store, archive, show in public, redistribute or commercially exploit in any way any part of the Content without the prior written permission of KOC. You agree not to use the Content for any illegal or improper purpose. You also agree to abide by all copyright notices and restrictions attached to the Content and not to remove or alter any such notice or restriction or alter the Content in any way. KOC shall not be liable for any claims, losses, injuries, penalties, damages, costs or expenses arising from the use of, or inability to use the Website or Content or from any action taken, or omitted to be taken, as a result of using the Website or Content, other than death or personal injury resulting from use of the Website directly caused by the negligence of KOC. To the fullest extent allowed by applicable law, you agree that KOC will not be liable to you and/or any third party for any consequential or incidental damages (including but not limited to lost profits, loss of privacy or for failure to fulfill any duty) or for any other indirect, special or punitive damages whatsoever that arise out of or are related to the use of the Website or the Content or to any breach of the terms by KOC, even if KOC has been advised of the possibility of such damages and even in the event of fault or strict liability. This Website contains links to other web sites operated by parties who are wholly separate from KOC. Links to all third party sites are identifiable because clicking on them will launch new browser windows displaying the third party's website URLs, or as otherwise signed as such by KOC. Such links are provided for your convenience and reference only and KOC cannot be held responsible in any way for the content, operation or availability of such websites. KOC reserves the right to make changes to any part of the Website and to add to or change these Terms. It is your responsibility to refer to the Terms whenever you access the Website. Every time you access the Website you agree to be bound by the Terms as varied or amended from time to time. By accessing the Website you agree to accept that these Terms are governed by and construed in accordance with the laws of the Republic of Ireland. You also accept the exclusive jurisdiction of the Courts of the Republic of Ireland in relation to any dispute that may arise in connection with these Terms or your use of the Website or arising in any way from the Content.